WRANGELL — The Anan Creek Wildlife Observatory in Southeast Alaska, an hourlong boat ride from Wrangell, is one of just a few Alaska bear-viewing sites where black bears rule the day, snatching salmon out of the water, scratching themselves in the dappled sun and shade of the mossy old-growth rainforest, and squeezing in and out of seemingly too-small caves formed by tumbled boulders. Brown bears can be seen here, too, on rare occasions, and the prospect of seeing both species fishing together is a big draw. Some of the facilities at Anan just received an upgrade. On Aug. 8, officials from the U.S. Forest Service; the city of Wrangell; and the Wrangell Cooperative Association, the tribe of the Stikine River region, gathered to cut the ribbon on phase one of a three-part improvement plan. Anan's combination of remote location and steady traffic makes managing human waste a serious challenge, so it's fitting that the ribbon was cut just a few steps from a 750-gallon vault toilet at the trailhead — one of the improvements. 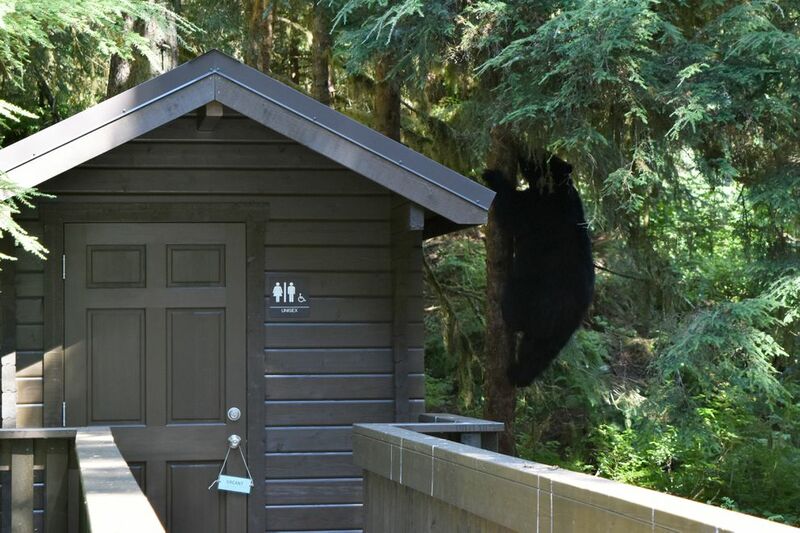 The old outhouse design, which used a trap to contain solid wastes while letting liquids leach into the surrounding soil, was a bear attractant. They'll investigate anything new in the area. A new color? Go bite it. A different smell? Dig it up. We saw evidence of that curiosity in the splintered wood of a railing post along the narrow, half-mile boardwalk that leads to the bear observatory. 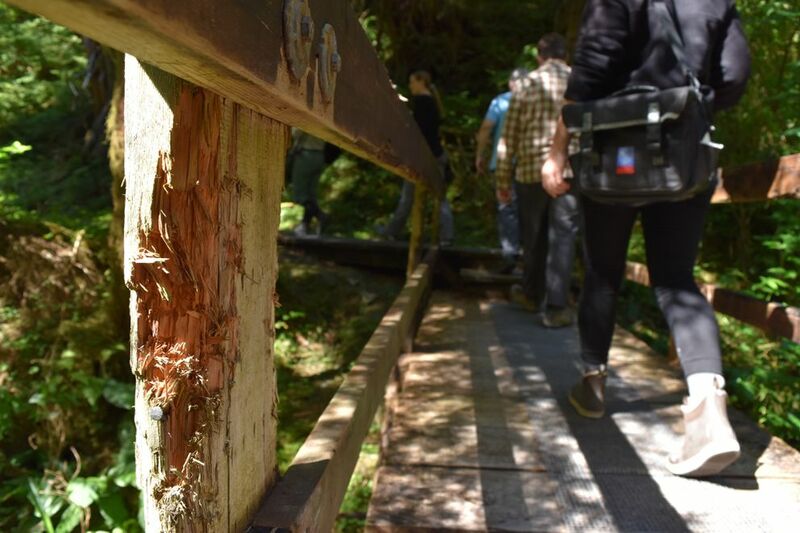 Bob Dalrymple, district ranger for the U.S. Forest Service's Wrangell District, explained that bears had chewed straight through one of the railing bars soon after installation. Another recent improvement — a new viewing deck overlooking a tidal lagoon — was relatively unscathed. For casual bystanders, it's hard not to be intimidated by creatures that make toothpicks out of wood chunks thicker than your arm. But for Trina Wade, U.S. Forest Service site manager at Anan Creek, undoing the mischief caused by curious young bears is second nature after her four years at the observatory. 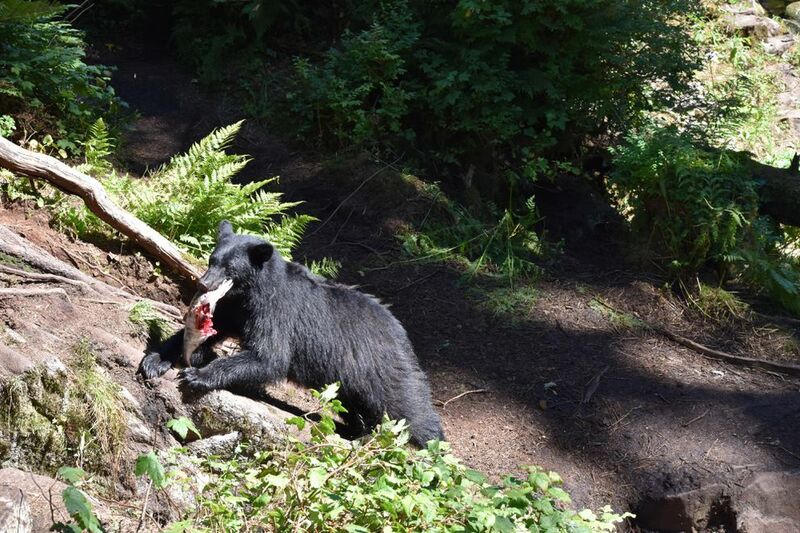 "Juvenile bears are very ornery and playful," she said, pointing out where she had to excavate the trail after a young brown bear, digging nearby, had buried it in dirt. They'll dig up anything that's interesting, including culverts. 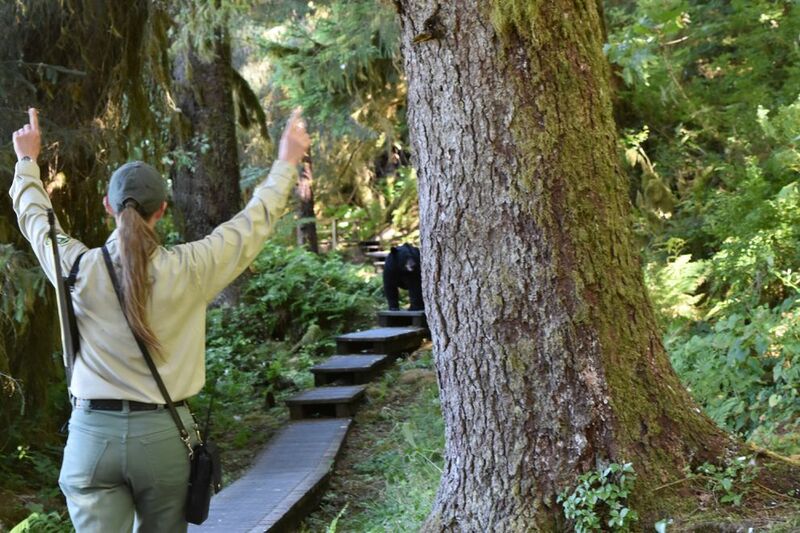 The bears like using the half-mile boardwalk that leads from the dock to the observatory deck, too — so the first thing guests see when they step off the boat is a Forest Service ranger who gives them "The Talk" on what to do if your group encounters a bear on the trail: Stand your ground until it gives way. You might have to "insist" by stomping your feet, scraping your feet in the gravel (bears don't like either sound) or speaking firmly to the bear as if it were a misbehaving child. There have never been any maulings at Anan — in fact, Forest Service officials said that there's never even been a case of a bear touching a person. That seems to be reasonable proof that the management strategy works well there, but it's just as important to note that guided groups arrive with two armed guards as part of every group of 10 people or less. The bears are, after all, still unpredictable wild animals. Actually, when our group encountered a black bear on the trail, we all stood back and let Wade shoo it off. After lingering a few seconds, feigning nonchalant disinterest as it scratched its chin with a hind leg, the bear melted into the bushes in near-total silence. As Wade pointed out, bears' comfort level is a little different from ours. When food is plentiful but not associated in any way with humans, and the humans behave predictably, the bears see us as just another unsurprising element of the environment around them. "They don't understand why we can't just pass by 10 feet from each other," Wade explained. 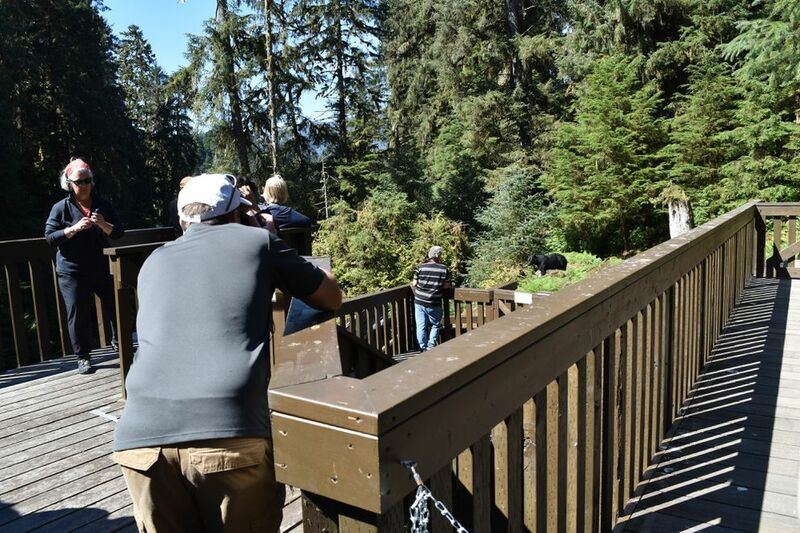 Our group counted 14 or 15 black bears in our time at the Anan Creek viewing platform, an expansive wooden deck with a small covered area and a camouflaged photography blind overlooking the falls. The half-mile walk to the platform, the old-growth rainforest setting and the routine closeness of the bears — sometimes crawling underneath the viewing platform to use it as a cave — all create a feeling of intimacy you wouldn't get in a wide-open setting. That intimacy comes with its own challenges. As part of the improvement plan, the outhouse that was previously located a short distance from the observation deck was moved closer, now connected directly to the decking and the railing. But that didn't stop two black bear sows from parking their cubs in trees near the outhouse. One of the sows, a female named Wolverine for the distinctive white "V" on her chest, sat at the base of her tree, leisurely picking apart a salmon, before climbing up to join her cub. You might expect that kind of proximity — or the painted-over chew marks on the railing — to dissuade visitors from using the outhouse. But when you gotta go, you gotta go. The waste from the outhouse is collected in Jon-ny Partner cans that can be filled in only a day or two, at which point they weigh roughly 80 pounds. Another of the recent improvements — a hardened gravel pathway leading to the tidal lagoon — makes it much easier to roll the full cans down to a Forest Service boat when the tide is right. The last major improvement of this phase is a new mooring buoy that accommodates watercraft up to 36 feet long with 30 inches in draft, serving both the Forest Service float house — where staffers stay during their eight-day shifts at the observatory — and the general public. The remaining two phases of the improvement project will include upgrades to the viewing platform and the boardwalk path leading to it, with an eye toward serving and enhancing the user experience. Meanwhile, the Anan Creek Wildlife Observatory is open and thriving with plenty of summer visitors. Over the course of a year, biologists estimate, 50-60 black bears and 15-20 brown bears pass through the observatory or spend time there. If you plan to visit, there are two key management periods. • June 15 to Sept. 15: People must stay on the boardwalk trails, no food is allowed at the site, no dogs are allowed and there is no camping within a mile. 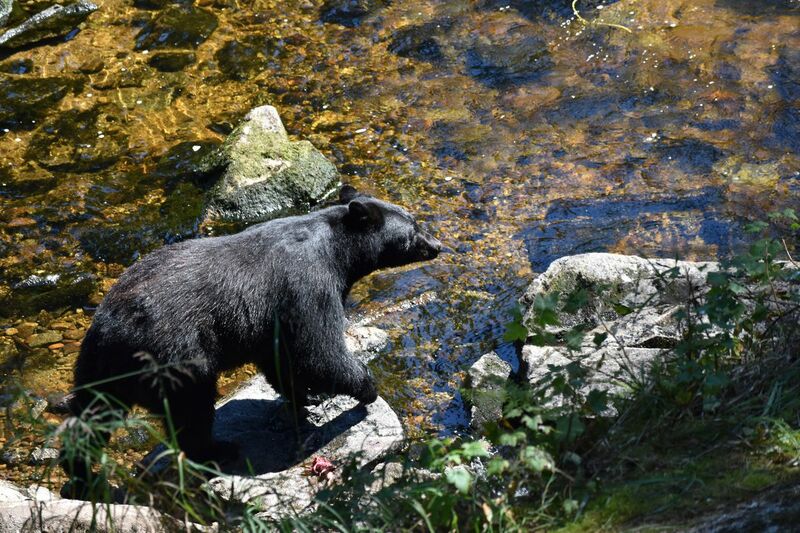 • July 5 to Aug. 25: During this peak management period, when the salmon run is strongest and the bears most active, visiting hours are limited to 8 a.m. to 6 p.m., and you'll need a permit that costs $10. Just 60 permits are issued per day: 36 to commercial guide companies, another 20 to the public and four handed out by the Forest Service desk in Wrangell. Get them at recreation.gov or at the U.S. Forest Service desk in Wrangell. If you have reservations, you can use the public-use Anan Bay Cabin, which is a 1-mile walk from the observatory, at any point during the year. Cabin fees are $55 for the peak season through Sept. 30, and $35 for the offseason from Oct. 1 to April 30 of 2018. Starting in the summer of 2018, the peak fee will be raised to $75 a night. Like most locations in Southeast, the Anan Creek Wildlife Observatory and the nearby public-use cabin are accessible only by boat or floatplane. If you visit with your own watercraft, be aware that the bay's shallow tidal flats and exposure to easterly winds can make docking or anchoring difficult. You can also join a guided trip from Wrangell or Ketchikan, or hire a water or air taxi to get you there, typically from Wrangell. Lisa Maloney is an Anchorage freelance writer and author of the new visitors' guide "Moon Alaska."